​This Kenwood subwoofer has a range of features, but they are all solely accessible through the remote control, and audio quality varies at higher levels of volume. ​Also, ​this features an aluminum enclosure with 8-1/4" x 5-1/8" Sub, improving on the low-budget plastic models that saturate the market. ​One of the primary areas that this product loses points is in the lack of manual controls; the remote is the only means by which you can adjust the audio settings. This model is cheaper than many similar compact subwoofers, though still has a good level of functionality. 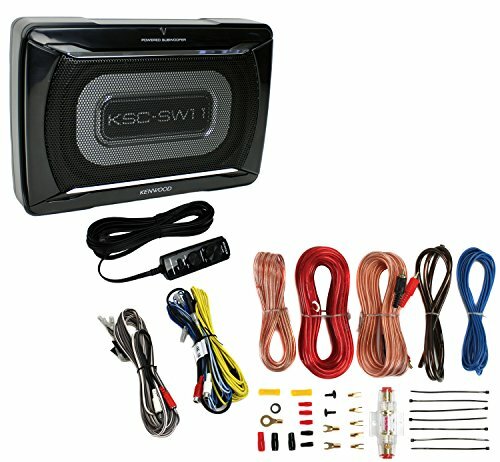 This review looks at a tiny, yet powerful in-car subwoofer, the Kenwood KSC SW11. It’s at the cheaper end of the budget range as far as automotive sound systems go and is small enough to mount into the most convenient and overlooked spaces within a car, such as beneath the driver’s seat. In the past, larger audio systems tended to dominate the automotive music scene. More recently, such units have begun to move in the other direction, where practical applications, sound quality and usability have become more important than ever. Kenwood's subwoofer, the KSC-SW11, is a compact unit that fits into the most unobtrusive spaces, yet still packs a punch. 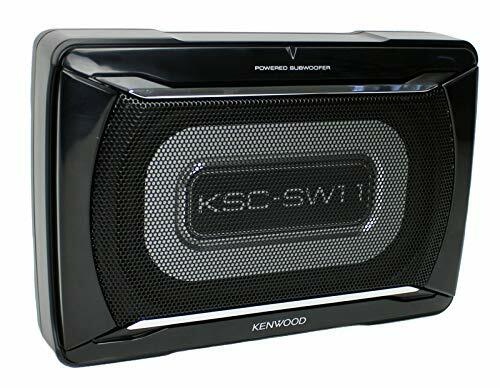 As a subwoofer, the Kenwood KSC SW11 is a compact machine with a lot of juice under the hood, though it is still lacking in some features that might be seen in larger or more expensive subwoofers. Bigger, pricier alternatives can put out greater levels of audio and more thumping bass, but also make for a much bigger footprint and are thus more difficult to fit into a range of vehicles. As a result, this unit is best-suited to somebody who has less space available within their vehicle, or who wants an enjoyable level of bass that isn’t going to blow out the neighboring windows. In the box, this product includes the Kenwood KSC-SW11 compact subwoofer, as well as a remote control for fine tuning the audio. The product itself has no manual controls built into the unit, so the remote control is the only means by which you can adjust its settings. The box also contains a 500cm length DC cord, as well as 2x bracket A and 2x bracket B pieces. One thing missing from this product is the wiring kit, which is not included in the box, so you’ll need to buy that separately before proceeding with the installation. Also, unlike some competitor models, this unit does not come with any additional mounting hardware, such as Velcro strips, for easier mounting. However, you should have sufficient brackets needed to fit this in a convenient location, underneath the driver’s or passenger seat. 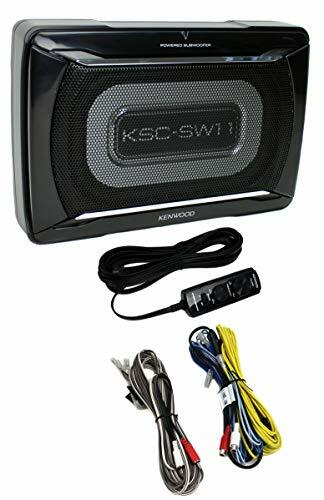 Below is a list of the key features that make up the Kenwood KSC SW11 subwoofer. The Kenwood KSC SW11 is a powerful subwoofer for such a small unit. Its compact design helps it to squeeze into the smallest of vehicles, while an aluminum enclosure improves resilience and sound quality. Though it will perform not so well when installed in much larger vehicles, it’s more than enough for the average user who is looking for improved bass, without shaking the sidewalk as they drive by.